“Look at those sharks!” is something that every charter boat captain has heard more than once while fishing the local waters in spring. And usually, it’s not sharks people are seeing, but large cobia, a much sought after game fish in these parts. Cobia have a natural affinity to floating objects – buoys and boats being some of their favorites. One of the most exciting things about cobia fishing is that you never know when one (or several) will pop up next to the boat. These constantly curious cobia will even follow sharks and other large fish to the surface when anglers reel them up. May through the middle of June is a much-anticipated time for local anglers, as it is prime cobia fishing. They can weigh upwards to 100 pounds, but the more common size caught in our waters is 40 to 60 pounds. But even with the smaller cobia, you can be assured a classic battle. These brown bruisers can tax even heavier tackle and, if brought in the boat too soon, can cause havoc in the boat, often breaking things and bruising anglers. The word cobia translates “crab eater” and many that I have caught have tons of calico crabs in their stomach. Most are sought using live menhaden, mullet, whiting and pinfish. Live eels are also popular, but difficult to handle. Heavy jigs and plugs also work well. One of the more frustrating aspects of cobia fishing is that they can be extremely finicky. This season seems to have a crop of extremely finicky fish as many anglers have complained of seeing numerous fish that had lockjaw. Conversely, when feeding they seem to smash anything in front of them. 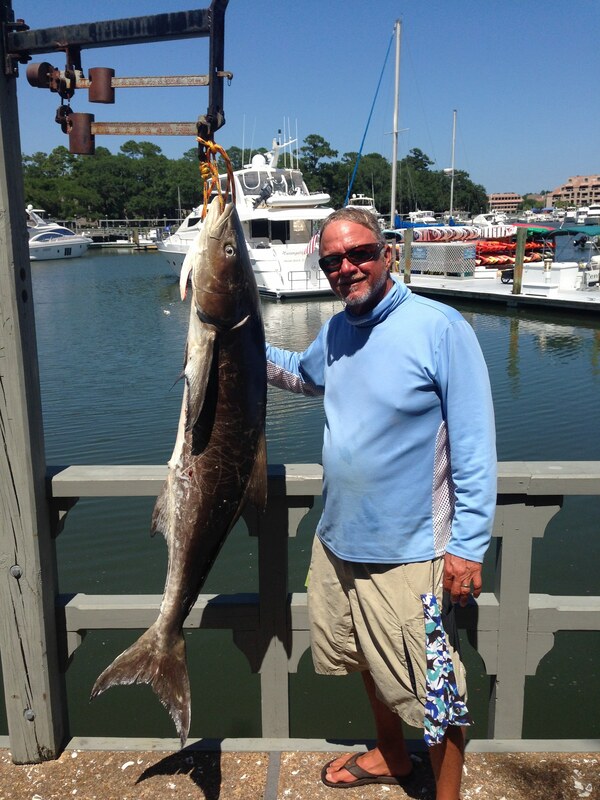 One of the best angling experiences the Lowcountry has to offer, cobia fishing is going off hot now. If you have never been, the time is right. Written by Captain Miles Altman of Bayrunner Fishing Charters, who has more than 41 years experience fishing the waters surrounding Hilton Head Island. Don’t miss the new “Finatic” boat, which can accommodate up to 12 passengers and features a special three-hour shark/dolphin eco-tour trip. Contact Miles at (843) 290-6955 to book an unforgettable inshore or offshore charter fishing trip, departing from Shelter Cove Marina.